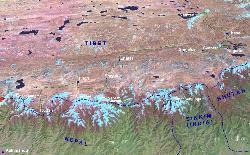 Overview map of our trip to Tibet. 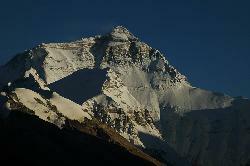 Approaching the Himalayas after half an hour in the air; Cho Oyo; Mount Everest; Lhotse; and Makalu are very close. 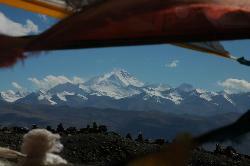 Mount Everest and Makalu from the north-eastern Tibetan side; a stunning flight. 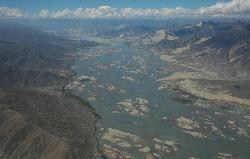 Yarlung Tsangpo (aka Brahmaputra) in its wide bed south of Lhasa. 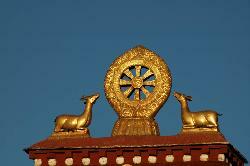 Roof of Jokhang monastery; one of the most revered sites in Tibet. 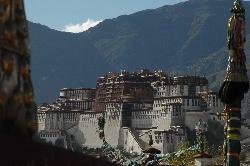 Potala; seat of the Dalai Lamas and the government before the Chinese invasion. 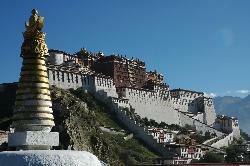 Potala; for a long time the tallest building on earth. 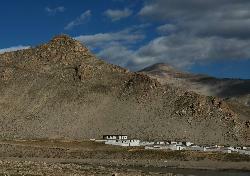 Half-way up to Chokpori; a second hill where the medicine school used to be. 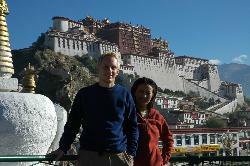 In the courtyard of Potala. 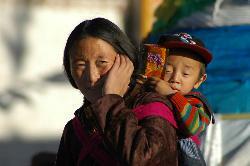 Pilgrim family doing the kora around Jokhang. 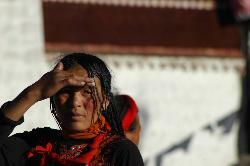 Every morning and evening hundreds of pilgrims and locals circumambulate the shrine. 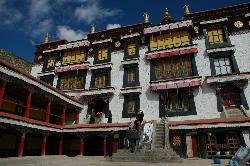 Norbulingka; the summer residence of the Dalai Lama. 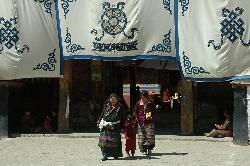 In front of assembly hall of Drepung monastery near Lhasa. 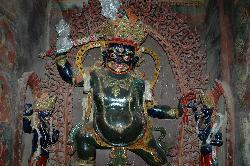 Massiv pillars support the the large building. 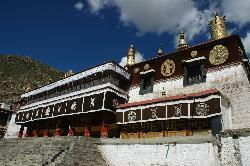 Tsurphu monastery lies in a hidden side-valley; it is from here that the head of Kagyu sect the 17th Karmapa fled to India in 2000. 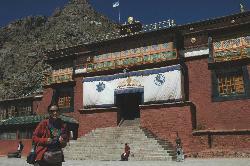 In front of the main building in Tsurphu. 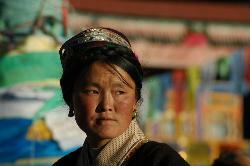 From Lhasa we drive three hours along the Yarlung Tsangpo to visit Samye gompa; Tibet's first monastery. 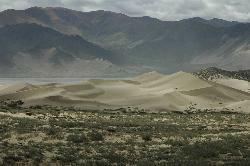 Passing endless dunes along the mighty riverbed. 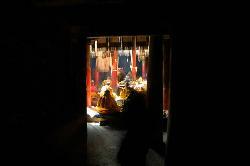 Pilgrims coming out of main hall. 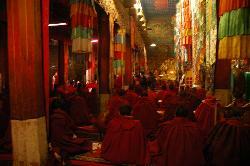 Solemn atmosphere during the chanting and playing of instruments. 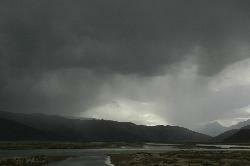 Heavy storm over the wide Brahmaputra valley on the way back from Samye to Lhasa. 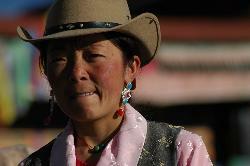 Hamlet near Damshung where we look for yak herders that guide us to Namtso. 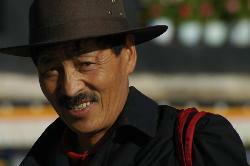 Yak herder and guide in his family's living room. 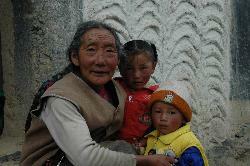 Grandmother in Damshung where we stayed for a night. 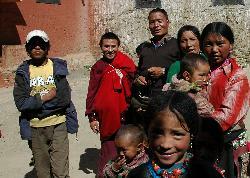 Getting ready for the trek; even our host family and guides to be are very excited. 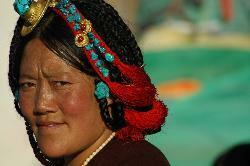 Since the road was finished some years ago only few people try to walk. 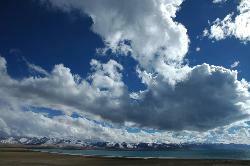 Clouds over "the Sky-Lake"; a fitting name for a lake whose colours change quickly and sometimes are hard to distinguish from the sky. 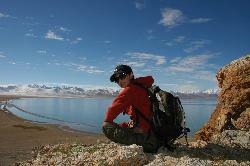 Sonam enjoying the rest and the view from a hill above the Heavenly Lake. 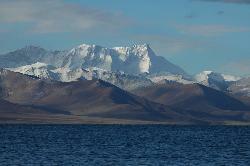 Nyechenthangla with 7'117 m forms the highest peak of the Trans-Himalaya and rises above the deep blue waters of Namtso. 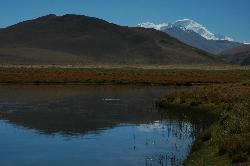 Tranquil lake in the morning. 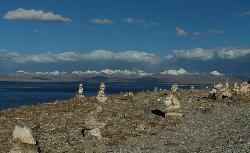 Tashi Do; the two isolated rock pillars at Namtso. 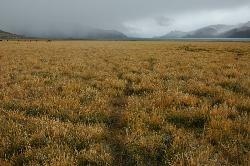 In earlier times it is said they formed the gate for the palace that was built on the penninsula. Just a ten minutes' walk from the car-park the place is quiet and peaceful. 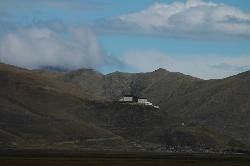 A nun lives in a cave from where we enjoy great views over the lake. 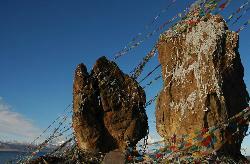 A natural fizzure in the rock; locals belief if you can make it through you have chances of a good re-birth. 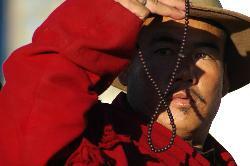 I admit I'm nervous but both Sonam and I make it through. 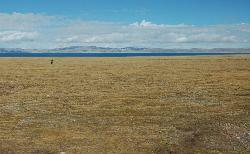 Piles of stones were erected by pilgrims on the eastern shore of the penninsula. 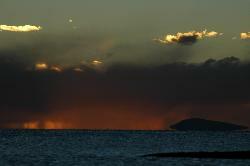 Storm coming up over the lake; often with harmless looking foggy clouds. 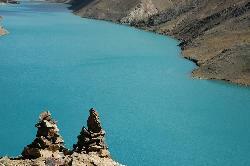 Stunning colours of the lake which silver dots on the blue turquoise waves. 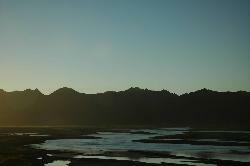 The lake has its own micro climate; sunsets are especially spectacular. 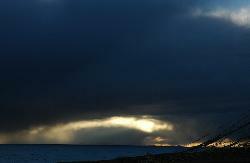 Dramatic end of a day. 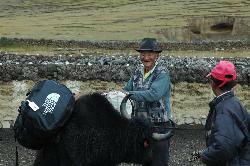 Yaks walking along the shore of the lake. 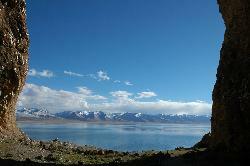 The space is overwhelming; driving back from Namtso to Lhasa. 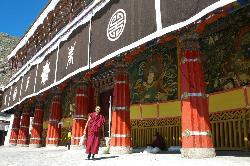 Via Lhasa and Yamdruk Tso we drive to Nagartse in snow and fog. 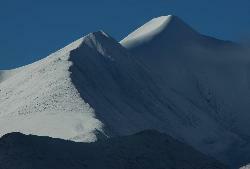 Luckily the next day the weather has improved dramatically and we will enjoy another week of warm sunshine. 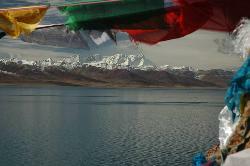 Thick fogs hides the Yamdrok Tso for most of the day; in the evening the fog slowly moves away and reveals the turquoise lake. 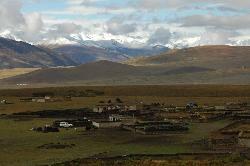 From Nagartse we spot the monastery of Samding across the wide plain. 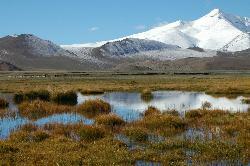 After a long argument with our driver he agrees to drive us to the monastery; it was a good idea not to walk across the swampy plain where herds of goats and sheep are grazing. 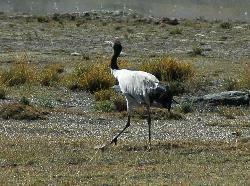 On the wetland of Nagartse we spot three rare black-necked cranes (Grus nigicollis). 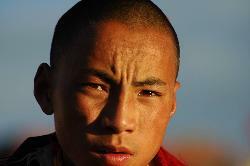 Degradation of habitat has reduced their number to 5'500. 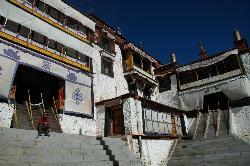 Samding monastery; a picturesque gompa with few visitors. 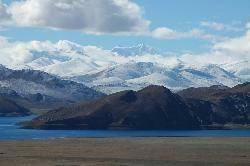 View from the monastery over Yamdruk Tso to some snow-capped mountains. 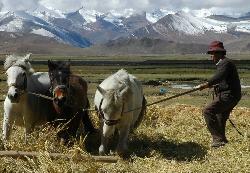 Below the gompa the villagers are finishing harvest work. 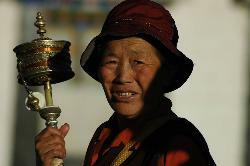 Treshing done the traditional way; in many areas machines were introduced in the last ten years. 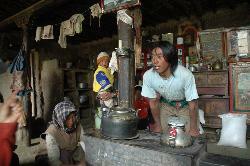 Mustards seeds are mainly crushed and used to make oil. 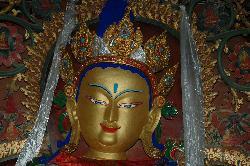 From Nagarze we drive over a pass below a hanging glaciers; drop into a plain soon afterwards and reach Gyantse. 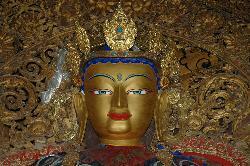 Gyantse it Tibet's third-largest city and is dominated by the old fort that overlooks the city and the monastery. 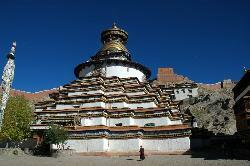 View from dzong to the surrounding hills where a secluded monastery rises between the shade. 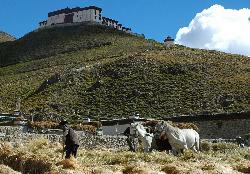 Gyantse monastery and Kumbum as seen from the top of the fort. 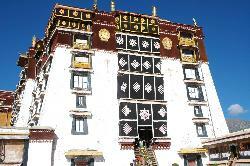 The Kumbum is one of Tibet's largest pieces of art; each of the 108 rooms contains religious objects. 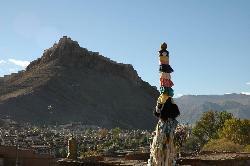 View from Gyantse Kumbum over the old and traditional village with the fortress on the hill watching over us. 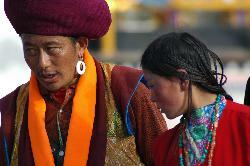 During the detour to Shalu we meet a group of pilgrims from Amdo; a region far in the north-east. 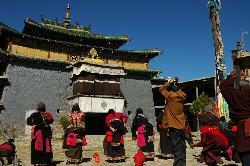 Shalu is a unique monastery; a thousand years old and with art coming from Nepal; China; Tibet and Central Asia. 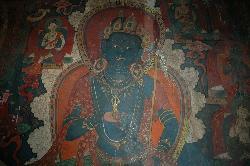 Its wall paintings are stunning. 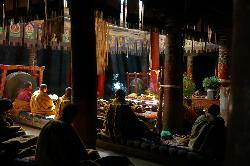 Light falls from the glass windows into the unlit room. 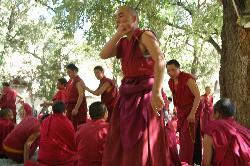 Ceremony is being performed by the monks. 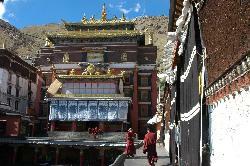 Tashilunpo in Shigatse is (or better was) the seat of Panchen Lama. 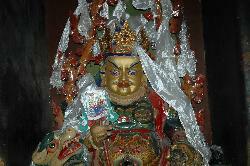 Since the original reincarnation was abducted by China and replaced by its own candiate (who is in Beijing); the monastery feels empty. 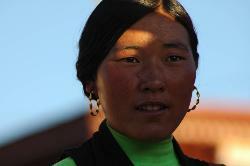 Leaving Shigatse very early in the morning; the rising sun turns the scenery into a golden light. 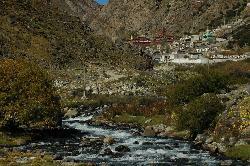 The whitewashed houses of Chusar lie below a ruined fort. 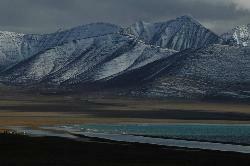 After a never-ending drive to Rongbuk we reach the pass and look back to the north. 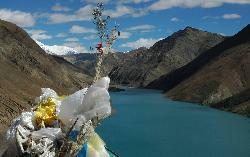 On the south side of the pass Mount Everest dominates the scenery; rising 8'848 m into the blue Tibetan sky. 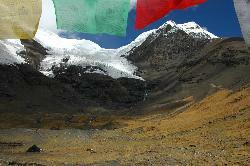 Panorama with 4 peaks over 8'000 meters - Makalu; Lhotse; Everest; Cho Oyo. 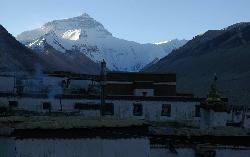 Late afternoon in Ronguk reveals the north face of Everest; or Chomolungma how it is called by Tibetans. 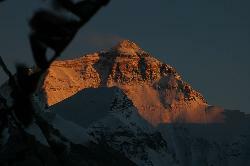 Late sunset on north face. 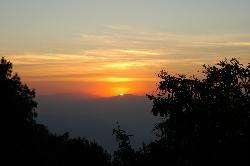 Sun on the summit; dusk has already set in. 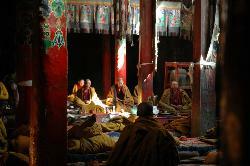 After a cold night in Ronguk monastery's storeroom I get up early to watch the sunrise. 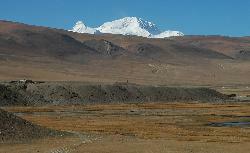 Through lovely valleys and villages we drive to Tingri and stop on the wide plain where Cho Oyo rises in the background. 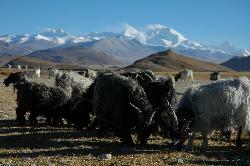 There's only few fields and people depend on their animals; dzos and goats are grazing on the wide area near the village. 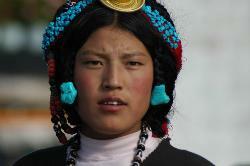 Cho Oyo from Tingri village. 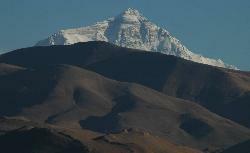 Everest rising over the barren hills of the Tibetan plateau. 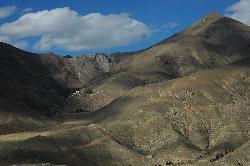 Beautiful but not natural; a dam led to the flooding of the valley. 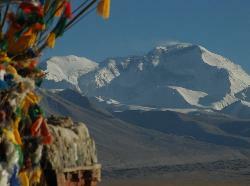 Shishapangma; 8'046 m; rises high above the plains and barren hills of the Tibeten plateau. 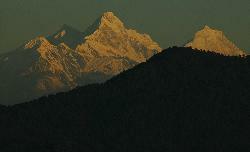 Himalayan giants on the horizon announce the border to Nepal. 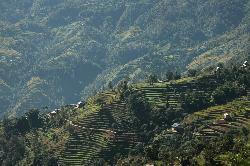 From the last pass the 5'050m high Lalung Leh we enjoy the panorama before descending quickly into the Kodari gorge. 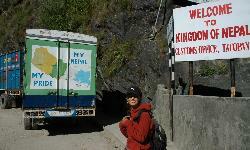 From Kodari we cross the Friendship Bridge to Tatopani and are back into Nepal. 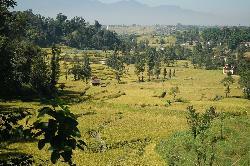 In Nepal we escape the city by an overnight trip to Nagarkot; driving through lush rice fields near Bhaktapur. 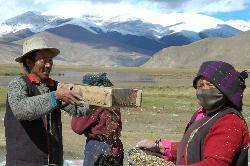 Outside the valley most people live as farmers and grow rice and millet on the steep hillsides. 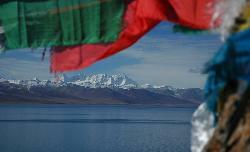 Last sunrays hit the peaks on whose other side we've been two days ago in Tibet. 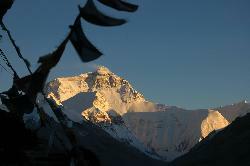 Sunrise on Manaslu; one of the 8 Nepali peaks above 8000 meters. 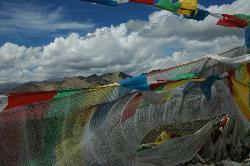 Enjoying the last views of the Himalayas.